Outlining major plans for 2019 and beyond, Development Strategies and International Trade Minister Malik Samarawickrama yesterday said the Ministry is targeting key investments from manufacturing and services sectors to attract over $ 10 billion Foreign Direct Investments (FDIs) over the next few years. The Minister stated two Singaporean firms have confirmed their interest to set up two oil refinery plants and a steel plant in Trincomalee, which is currently being fast tracked for implementation. “The two projects are on track. The Singaporean investors working on the steel plant will visit Sri Lanka next week. A land extending to about 500 to 700 acres has been identified in Trincomalee and it will be soon released to the Board of Investments (BOI) to be leased to the investor. This steel plant is a $ 1 billion investment,” Samarawickrama said on the side-lines of the 17th Exporters Forum in Colombo yesterday. According to the Minister, the refinery projects are also massive investments that will run into a period of time. “The total investment of one of the refineries is around $ 3 to $ 4 billion and the second one is double that amount. However, these investments will come over a period of time,” he added. He pointed out that one of the key objectives of entering into a free trade agreement (FTA) with Singapore was to attract much-needed FDIs to our economy. In addition, Samarawickrama said a Chinese firm with an investment of $ 100 million will break ground next month to set up a cement plant in Hambantota. Subject to the final figures to be released by the BOI, the Minister noted that Sri Lanka has attracted around $ 2.3 billion FDIs last year and is expecting to attract $ 3 billion total FDIs by the end of 2019. “All these years, we have been mainly attracting and focusing on investments on utility and property development sectors. But now, we are focusing on manufacturing and services sector which can generate more employment opportunities and income opportunities for our people,” he stressed. He said the Ministry together with its institutions will look at a couple of roadshows to boost trade and investments this year as it was essential to reassure the investors after 51-days of political crisis in the country. “Due to this unfortunate political crisis, we have to now rebuild the confidence that has been eroded. We took a long time to build that confidence during our roadshows to Japan and Germany, which are highly sensitive markets. We lost out a lot during those 51-days,” he claimed. The Minister along with senior BOI and EDB officials yesterday met with the German business community operating in Sri Lanka to reaffirm country’s political and economic stability and to encourage investment expansions in the island. During his remarks at the forum, the Minister reiterated the Government’s commitment to the export agenda, to ensure policy stability, to support exporters to grow and do better and to resolve their issues in a timely manner. “We now have a set of forward-looking policy frameworks that will support a paradigm shift in exports in Sri Lanka. While opening up more to Asia, we remain focused on growing more in our traditional markets of the West too. We regained GSP+ with our commitment to good governance and the rule of law, and this has given a new lease of life to our exporters into Europe,” he added. The Minister also assured that the National Export Strategy (NES) has a dedicated implementation team from the Ministry and EDB, and work is going ahead apace. “Today, I received the first Progress Review Report on the NES implementation for the first six months period. I will be taking a close look at this and see how we can accelerate implementation. We are also working closely with other Ministries and agencies that need to support exports,” he said. 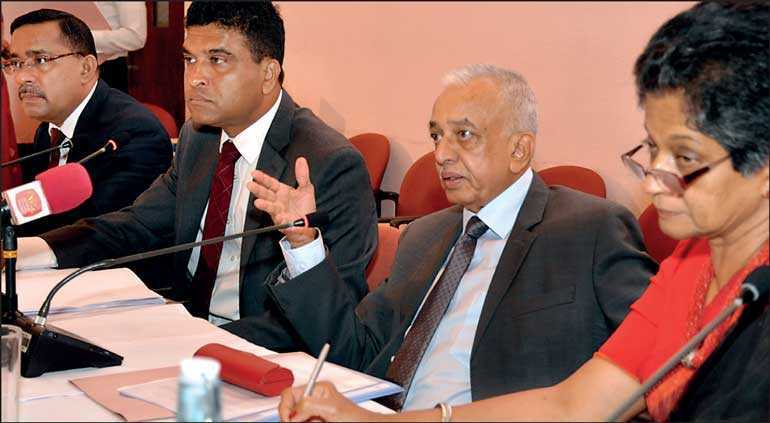 Samarawickrama said he is holding a high-level meeting with the Ports and Shipping Minister Sagala Ratnayaka and Civil Aviation and Transport Minister Arjuna Ranatunga today to coordinate and iron out matters relating to the logistics services sector of the NES. In terms of the six months progress made by the NES team, the Minister particularly commended the performance and the progress of the ICT sector, which has picked up pace and contributed considerably to the national export earnings within a short span of time.